Providers, payers and vendors do business under a complex and constantly changing array of rules drafted by several agencies and departments. 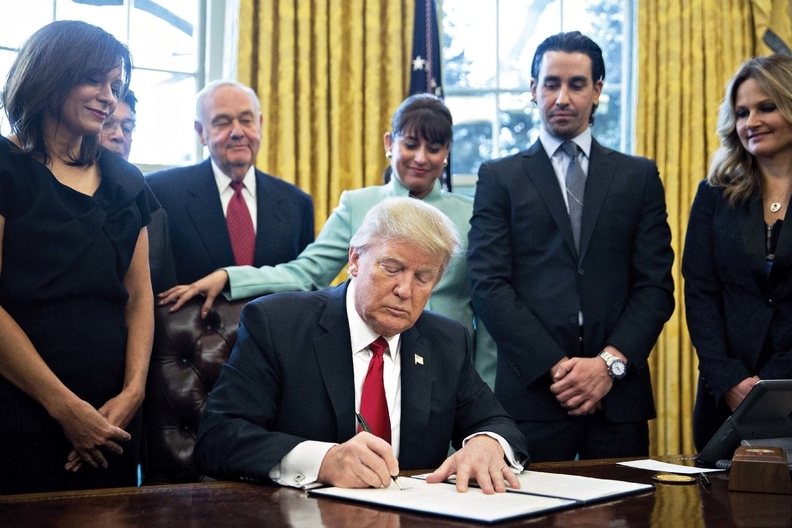 Healthcare is one of the most regulated industries in the U.S. economy, so President Donald Trump made a lot of healthcare leaders happy with his executive order calling for the federal government to kill two regulations with each new one it rolls out. Fulfilling that promise will be complicated, if not totally unworkable—the order raises important questions that might not be answered until it's enforced in practice. It will be up to the Office of Management and Budget to standardize how regulatory costs are measured and clarify what qualifies as new and offsetting regulations—the agency already issued interim guidance for regulators on Friday that answers certain questions. Nevertheless, trade groups representing stakeholders across the industry have long lists of requirements they'd love to see the administration erase. Providers, payers and vendors do business under a complex and constantly changing array of rules drafted by several agencies and departments, including the CMS, the Health Resources and Services Administration, the Food and Drug Administration and the Office of the National Coordinator for Health Information Technology. Almost all of them come with a cost, and Trump's order also calls for an annual cap on the economic burden of new rules. For the rest of fiscal 2017 the cap requires that the cost of additional regulations be completely offset by undoing existing rules. Last year alone, according to the American Hospital Association, the federal government added 23,531 pages to the regulations affecting hospitals and health systems. “The regulatory burden that is imposed on hospitals and health systems is substantial and unsustainable, and has grown in recent years,” AHA CEO Rick Pollack said in a statement praising the order. Among the major rules released last year were ones that mandated a medical loss ratio for Medicaid managed-care plans; banned discrimination at federally funded hospitals, physician practices and clinics; and clarified how physicians will be paid under the new value-based framework outlined in the Medicare Access and CHIP Reauthorization Act, known as MACRA. We asked healthcare trade groups which requirements they'd like to see killed when the Trump team starts culling federal regulations. Here's a sampling of what they said. In December, Pollack penned a letter to Trump urging the president-elect to relieve the regulatory burden on hospitals and included an eight-page list of requirements the association considers onerous or unnecessary. For example, hospitals want the CMS to pull the plug on Stage 3 of the program that requires them to demonstrate they're meaningfully using electronic health records. Another big target for hospitals and physicians is the complex regime of Stark Law regulations intended to prevent physicians from making referrals based on their own financial interest rather than clinical judgment. Most regulations, like the ones implementing MACRA and the Stark Law, are driven by Congress. The 21st Century Cures Act enacted late last year—although much of it is intended to give drug and device manufacturers less regulatory friction in getting innovative products to market—will require a significant amount of rulemaking to achieve that. The law also includes provisions aimed at improving mental health services and addressing the opioid crisis. Trump's vow to reduce the regulatory burden will be complicated by obligations to carry out the requirements of complex laws like MACRA and the 21st Century Cures Act. A day after issuing the executive order on regulations, Trump met with pharmaceutical industry leaders at the White House and told them the administration would do its part to eliminate regulatory obstacles while asking them to do their part to bring down prices. Many agencies are in the process of drafting rules for laws that have recently gone into effect, noted Sean Moulton, manager of the Open Government Program at the Project on Government Oversight. The order applies to any new regulations issued between noon on Jan. 20 and Sept. 30. Removing regulations can cause nearly as much disruption as adding them. Providers and vendors have invested significant time and money to adjust their businesses to new or upcoming regulations. “We don't know which of these healthcare regulations that the healthcare industry has already complied with and sunk costs into are going to have to be repealed in order to allow for expected regulations,” said Amit Sarang, a regulatory policy advocate at watchdog Public Citizen. And maintaining the zero-sum regulatory math will multiply the work of regulators who now must spend significant time looking for rules to gut in order to pass new ones, Sarang said, noting that the process for repealing rules is just as lengthy as the process for proposing them “The rulemaking staff will now have to devote all of their attention to getting rid of rules mostly,” Sarang said. Many healthcare-related federal agencies issue most of their directives in the form of guidance rather than formal rulemaking. The OMB's interim guidance on Trump's executive order notes that new significant guidance or interpretive documents may be covered, and “will be addressed on a case-by-case basis.” The OMB said agencies should ensure that it's clear that compliance with any guidance is voluntary and that any cost savings claimed for guidance under the “one-in, two-out” program must be specific and verifiable. The guidance also provides additional information on the OMB director's ability to exempt certain regulations from the requirement, noting that may include “emergencies addressing critical health, safety or financial matters.” Pre-defined exemptions in the executive order included regulations dealing with the military, national security and foreign affairs, or any regulation that only affects other agencies or deals with agency management. It also notes that the guidance doesn't apply to federal spending rules that primarily cause income transfers from taxpayers to program beneficiaries, like Medicare spending. But it does note that in cases where the rules impose requirements on businesses, like reporting or recordkeeping requirements imposed by MACRA, the agency issuing a new regulation would need to account for the cost of those requirements. The “one-in, two-out” approach has been tossed around for several years, but it hasn't been adopted in the U.S. because many believe it's not a targeted approach to reducing regulatory burden, said Michael Livermore, a University of Virginia law professor who specializes in regulation and cost-benefit analysis. The United Kingdom has a “one-in, two-out” rule that applies specifically to legislation that will increase costs for businesses and not-for-profits. The rule requires policymakers to remove or modify existing regulations to the value of 2 pounds of savings for every 1 pound of cost imposed. Canada has a “one-for-one rule” that requires rulemakers to remove a regulation for every new regulation that imposes an “administrative burden on business.” The Canadian government says 19 regulations have been taken off the books, resulting in over $22 million in reduced administrative costs for businesses and the elimination of an estimated 290,000 hours a year that would have been spent in dealing with regulations. But Trump's order could be unworkable in practice and might not have any teeth, Livermore said. That's not uncommon with executive orders in the U.S., he said, pointing to a rule that President Bill Clinton issued to limit regulations that would have an effect on state and local policies. In the end, he said, it was too expensive and difficult for agencies to determine the impact of their rules on municipal and state governments. Livermore also wondered why the Trump administration would implement an order that could limit the ability of its own cabinet to put rules in place.